This kitchen under cabinet 2w warm white LED light in polished chrome finish is 230v mains operated, energy efficient and practical. 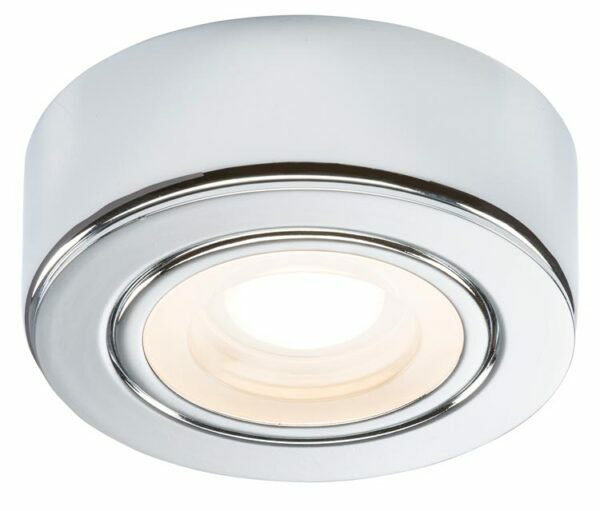 It’s suitable for surface or recessed mounting below kitchen cupboards to illuminate the worktop or as cabinet display lighting. Polished chrome 73mm diameter body and lens containing non-replaceable LED’s to illuminate your kitchen worktop with 125 lumens of warm white light. No driver required, simply wire into the mains supply (live, neutral and earth required). Can be recess mounted in a 58mm cut-out or surface mounted using the supplied fixing kit. Please note that the LED lamps fitted in this product are non-replaceable. The unit should be recycled in the correct manner when it reaches the end of its 30,000 hour life.